One of my favorite wedding venues where I get to perform wedding ceremonies is The Pavilion on the Lake in scenic Tavares, Florida. Tavares is known as the sea plane capital of the world. Less than 45 minutes from bustling Orlando lies Tavares and The Pavilion on the Lake. One of the beautiful things about this location is it offers both the beauty of a lakeside wedding with an expansive view of Lake Harris plus all the comfort of an indoor wedding. The large windows in the Pavilion offer gorgeous views of the lake. Saturday, February 9th, Chris Benoit and Lauren Cobb were joined in marriage with about 100 of their friends and family in attendance. Jeff Thompson of Sensational Ceremonies provided a custom wedding with some personal touches for Chris about his favorite team, the New Orleans Saints and for Lauren and her career with Marriott International. 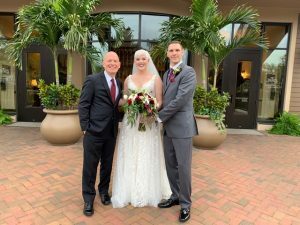 Weaving some words of advice and counsel from Bill Marriott and lessons learned by the Saints in a recent lost football game and how those lessons learned could benefit a marriage, Jeff united the couple in marriage in a 20-minute ceremony. A beautiful wedding cake was designed by Meghan Bradburn of Le Petit Sweet. Pisces Rising, of Mount Dora, catered the affair. Joe Marolis of Elegant Entertainment provided sound for the ceremony, as well as music for dancing throughout the evening. Jolie and Amanda of “I Do Events and Party Rentals” kept things organized for the bride and groom and wedding party.